Ummm, can’t you just smell the pollen in the air? This entry was posted in Month of March, Weather. Bookmark the permalink. Just dreaming of pollen in the air !!!!!!! Still have 2ft of snow. Ice, ice and did I mention ice . Bees were busy with cleansing flights yesterday. I checked all my colonies today. I’m a little scared. There is still good size colonies with lots of stored carbs yet. The pollen substitue that was added is being consumed in droves over the last couple weeks. I’ll be really surprised if the bees do not explode again this year. I don’t think I will have much trouble making a bunch of splits this year with the numbers that I am seeing already. 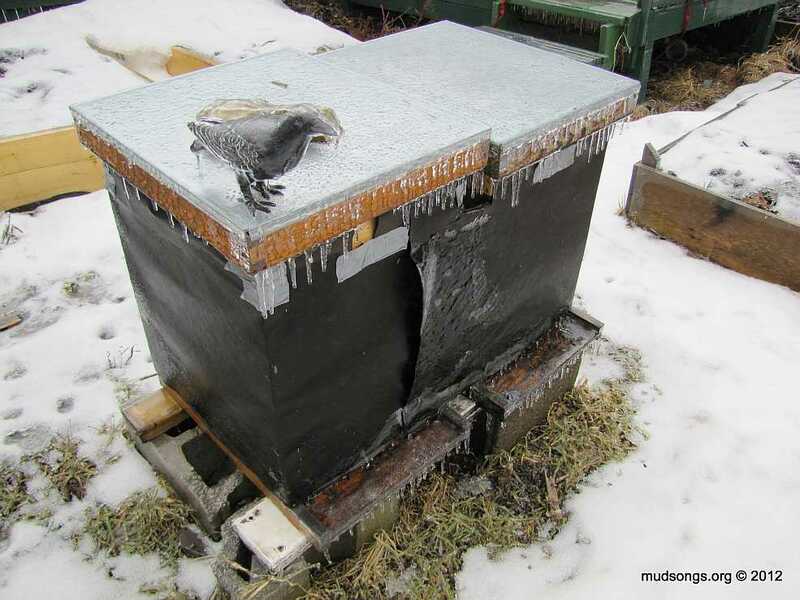 The 10 frame nuc is still really strong consdiering it was a single box going into winter. I’m reading up on Warré hives. Certain aspects of the hive design and method of beekeeping seem to make more sense than Langstroth’s. I’m not convinced it would work in my local soggy climate, but it’s fascinating stuff. I’ll write up detailed post about it as soon as I can. If your colonies are doing so well, what are you scared about? Swarming, I suppose. But you’ve done your homework better than anyone. You know what to do. I haven’t checked my hives for a couple weeks. I hope they’re not running low on pollen. They sure come alive when the sun it shining, though. Here’s a question for you: What’s the most practical tool I might need for building hive components? A table saw? I’ve decided — especially after reading this Warré book and seeing what a straightforward construction it has — that I need to start building my own stuff, or at least cutting most of the wood. I don’t know where I’ll set up shop, but I’ll figure something out. It’s frustrating to hear about all kinds of great hive contraptions and not being able to get my hands on them except through some US company that charges more for shipping than the actual product. Table Saw. For the types of material we are cutting a Canadian Tire jobby or something similiar will do the trick. A chop saw would be a nice bonus but if you get proficient with a hand saw it will be ok too. I use the chop saw when the kids are awake and a handsaw when the kids are alseep. But the table saw it the best for what you need. I was working on my plastic pot feral swarms yesterday. These colonies will be stragitically placed in the valley for drone propagation, nothing more. If I have 3 or 4 colonies kicking out drones then helps with the mating. Also a few may swarm in future years and I’ll have some swarm traps out. So who knows. For your style of beekeeping the Warre hives work well for you. I need to get my hands on some plans for bottom style pollen traps. I’m not sure what my style is yet. My lack of land is cramping my style. Like I said in my rambling post, I’ve been keeping myself reigned in because it’s frustrating to think about things I can’t do because I don’t have the land. (We’re looking into building an 8-foot stockade fence behind our shed. With a few creative security measures, it’s cheaper than moving out to the country.) I do lean more towards non-invasive beekeeping, though. I’m not convinced yet that Warré or any kind of foundationless hive will thrive in the St. John’s climate, but the square shape of the brood boxes does seem to make more sense than rectangular Langstroths. I’m curious now to learn why Langstroth settled on the rectangular boxes, or maybe moveable frames and bee space was more his thing and he didn’t really care about boxes. The benefits of square brood boxes combined with the convenience of moveable frames seems like the perfect combination. I’ll be sticking with Langs until I have more room to experiment. Thanks for the tip about the saws. I grew up in the suburbs where nobody knew anything about anything practical. Even basic carpentry is out of my depth, but it doesn’t take long to realize that it’s an asset in beekeeping. I read a little more on drones and queen rearing since I’ve been laid up sick with the flu. It’s definitely something I want to attempt next year. I’m glad you and the other beeks are trying it this year. It’ll be good to learn from watching what you do. Even though my urban environment is far from ideal, I’ve found people and friends around town willing to host hives for me, several within just the right range of drone and queen mating flights. I also know a guy on the other end of town who’s letting me set up two hives on his property this year who says he sees honey bees on his sedums (photo) every year. But I doubt they’re my bees because it would be the very edge of my bees’ flight radius. So there must be another beekeeper in his area, and if that’s the case, it might not be a bad place to set up mating nucs, help with genetic diversity. Oh, and by the way, I should know within a couple weeks if I can get my man to cut us a truck load of supers for this season. It’s only 2°C, but it’s sunny and the bees are busting loose today. Lots of orientation flights and cleaning up of the dead. All four hives look like they’re doing great. It would be curious to check the variety he has in his yard. also you can check to see the direction the bees are flying to confirm if they are yours. Have you had either peak at your bees lately? I don’t know who is getting more anxious for spring, the bees or me…. The foundationless hive is active. All the drones are probably long since dead (there were plenty of them going into winter). Its winter honey stores were never high, but like all four hives, it’s been chowing down on sugar and pollen patties for a while. Its population is probably rising fast. It went into the winter will a small cluster, but my guess is it’s mostly a Carniolan colony that will most likely bust loose in the spring. The queen should have plenty of empty frames for laying. The other 2010 hive is busting loose too. It seems to be doing just as well as the foundationless hive. The 2011 hives don’t seem to be as active when the sun comes out. One of them seems okay, but the other seems nearly dormant. It’s been slow to get going when the sun comes out all winter. I think a mouse could be trapped inside. A saw honey leaking out the front of the hive earlier in the winter. Anyway, I took a peek under the hood and saw plenty of bees in the middle of the top bars eating up the sugar and the pollen patties. So it might just be a genetic line that doesn’t go outside unless it absolutely has to. So all the hives seem to be alright, but I’m curious what I’ll find in that last hive during the first inspect on the spring. Could be queenless. Could be anything. And the excitment builds. I am hoping for one of those early april 15°C days where you can do a quick inspection but there is nothing in the forecast to suggest that as of yet. When will it warm up…. That being said all colonies are doing well. I’m glad I added the pollen suppliment to them a while ago when it hit 7°C. At least there is some protein for colony growth and there is a lot of carbs still present. It’s not so icy anymore (though we are getting a snow storm this weekend), but I have noticed something new over the past few days. Some of the bees have been flying out of their hives, then landing in places all over the yard, some of them in groups near the hives, and that’s it. They don’t go back into the hives. They sit there and freeze to death. If you look around my yard on the back deck, the BBQ, the fence, etc., you’d think, “Oh, look at all the bees just hanging around.” Nope, they’re dead. It’s probably not abnormal. I see plenty of bees dead in the snow throughout the winter, but this seems different. I’m not sure what to think of it. Hopefully today’s snow storm is the last of the year. In Newfoundland, it’s called Shelia’s Brush. I don’t know why they call it that. I’m from Nova Scotia where names aren’t given to this kind of thing. Or maybe they are. I grew up in a suburb that wasn’t exactly the cultural core of the province. Anyway, we’re snowed in today and so are the bees.